Bob Kauflin preached this morning on "The Depressed," part 3 of our series on Psalms: Real Help for Real People. Though it wasn't the main point of the message, I think the idea that I most appreciated was this: We too often go to the means of grace as if it is the source of grace. For example, encouragement is a way that God helps us. But we can quickly forget that God is the source of help. The encouragement is only the means of help. When we forget that, we look for encouragement - the means - in order to get out of our most recent "depression." Instead, we should look to God, and seek his grace in whatever form he chooses to deliver it. He is faithful to give help and mercy and strength and grace and joy to those in need. You can listen here soon if you haven't heard the message, yet. I have a few reverberations from this morning. We completed our second week of the checklists. I got a lot fewer change suggestions this time, which means that the first week took their checklist-editing task very seriously. Thanks! I wanted to answer a couple questions that came up from the lighting checklist, though. "What are focus arrows?" This question refers to the task, "Identify pairs of lights for each area of musicians. Indicate those channels on the stage diagram with focus arrows." Focus arrows are a simple way to indicate on the stage diagram what lights are on specific locations and the direction from whence they come. 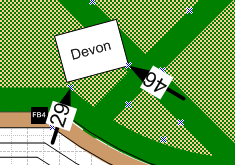 Instead of just listing that Devon has lights 29 and 46 on him, the arrows also show instinctively the direction of the light. This is very useful to have when trying to balance levels between the two lights and also helps later when others need to come in and reprogram from your work. "At what time do we set the backstage area lights? There is much movement until just before the first service?" This is a new item for most lighting folks, so let me explain. From a general perspective, I want our lighting operators to take responsibility for anything related to light. That includes things like overstage worklights, window blinds, backstage lighting, catwalk lighting, etc. One of the common sources of distracting light in blackouts is the backstage lights. The checklist indicates which ones should be on and which should be off. These settings allow easy and safe movement backstage while minimizing that actual light on the "stuff" back there. As far as when to turn them off, I'd recommend making a sweep at 8:45a and 11:15a. That is close enough to the service to minimize people coming behind you and turning them on. It still gets you back in your place in plenty of time for the service. Also, we will post signs by the light switches to indicate to others which lights should be on and off during an event. Hopefully this will discourage folks from flipping switches for their personal convenience. Are we expected to stay almost an hour after the service ends? This refers to an after-service checklist section which is titled, "At 1:50p or later..." This gets at a question that I'm sure will arise again from several others: "When can I leave?" My main goal is to avoid this scenario: Joshua Harris - "Thanks for coming today have a great Sunday. You are dismi-" Boom - the sound system goes off, the projectors show "Power Off? Confirm?," the lights on stage go out, people rush the stage to tear down. Instead, I want to have the mentality that our service to the pastors and congregation lasts until they leave the room, until ministry is over, until people really have moved on from the Sunday service experience. For the most part, this will mean that the sound and lighting systems can be turned off when the majority of the people have left the auditorium and moved into the lobby. Frequently, that will be 20-30 minutes after the service ends. But know this: if you do need to skeedaddle and make your way out earlier than that, you can ask someone else to take care of those last few details for you. Thanks for asking these questions, Dave. Lower thirds is the term we video geeks use to refer to images that overlay on the lower third of the screen to show stats or names or the like. Often they are over some sort of rectangular bar to separate them from the camera picture. We've been trying to add pastor's names as lower thirds since Easter. It's been hit or miss, honestly. Today we had the most catastrophic glitch in our normally reliable FSR Compass S2 switching system. It would not leave key mode, which is the mode used to create the overlay. After Bob got up to preach, strange things were showing up on his black suit-jacket: his title bar, some clouds from the computer 1. No matter what we tried, it would not leave key mode. And every time we tried to fix it unsuccessfully, the picture glitched. So, here is the conclusion: The graphics switcher is not the place we should be overlaying in the titles. We really need a character generator to benefit from the downstream keying of our camera switcher. A character generator is fairly expensive, but we'll try to get it in the budget next year. In the meantime, we're going to scrap the lower thirds. It's just too much risk for the limited effect. Mitch, your team rocked it this week. Thanks for making everything happen so smoothly. It seemed like the band was able to quickly get through soundcheck and to rehearsal. Julie, I loved the sound this morning. The low end had energy without being overwhelming. The vocals were clear but also spacious. One small thing that I really loved: Patrick meticulously taped down all the cables. Thanks, Patrick, for pursuing excellence down to the simplest details. The DPA headset microphone tends to bend in toward the mouth more the E6s do. Please place it about 1/2" behind the preacher's mouth rather than right at the corner of the mouth. With extended worship and ministry at the end, I'm unclear when to turn off the subwoofers for the benefit of the people down front. I'll try to clarify that. Jim has worked expecially hard to make a table for Jake's DJ gear. The new table hides the cables and gives Jake plenty of space for stuff, so please take the extra time to tidy up the four cables coming off the table. Does anyone know why Jake's click track always comes through the intercom? Talk about a funky but consistent issue. We need to make sure to "tune up" the lights in catwalk 1 on our next work day. Some of them are more even than others, and the uneven ones are standing out on the new backdrop. If you've never learned how to "park" lights as opposed to capture them, check in with me. We'll be parking the Gym2 lights regularly during the 1st service. I'd like to have a pow-wow with all the lighting folks sometime soon to discuss the best way to light the sermon area. I'm not sure I know exactly what the best approach is, but I want us all to be on the same page so that we can fix them if there are problems. The number one issue this morning was that you didn't get an accurate script. That's my fault, and I will be taking that up with the production staff as well as pastoral staff. I can't promise we'll always have a perfect script for the announcements, but we've got to do better than this last Sunday. I'm sorry about that. Camera 4 operators need to identify the required iris level at the ministry mic before the service, so that you can set up the shot in the dark during the service. You will see an addition to your checklist something like this: "Ask the lighting operator to turn on the ministry mic lights. With someone in the light, set your iris level correctly and note the f-stop marking on the lens. Use that f-stop level when you set up for a ministry mic shot in the services." When the camera team hears about a pending "ministry mic moment," camera 4 should immediately get set up for the shot: frame the shot, focus on the microphone, and set the iris level to the f-stop you identified before the service. Finally, camera directors can help the transitions out of the ministry mic by making it a practice to go to black at the camera switcher after each person shares. That way, if a pastor follows up, we can just go to another camera. If another person shares from the ministry mic, we can come back up on camera 4. And if we go back to singing, the house director can take it from camera black to lyrics. And one last thing for house directors and playback operators: please make sure to watch the videos all the way through together, so that you both know where it ends. OK, it's time for T4G, so I should go. Please comment below if you have any further suggestions, thoughts, or ideas about what I've written. I enjoyed Julie's mix, too. It was consistent and clear. musical and undistracting. Like last week, I'm not sure it achieved your ideal of being electric guitar focused, but I think that was again mostly a band arrangements issue. Dave, thank you for you patience Sunday morning with our team. I think with all the glitches, mistakes and error during 1st service was the worst I've experienced in my IMAG history. Your patience, gentleness, and trust in God in those tempting situations are truly fruit of the Spirit! I didn't get the chance to reply to your comment on last week's post, but I just wanted to mention that I completely agree with what you're saying. If the band isn't arranging the songs to focus on the electric guitar, we can't make it so. Thanks! Thank you both for your patience. I pray for assistance from God as I work the switch so that these glitches are minimized during sunday's services. I have A question regarding the presets, and wonder if this is the right format to ask. Is there a way to have feed back that lets you know which is the current preset at any given time? I was a guest at the meeting last Sunday. It's useful to be reminded of all the thoughtful behind the scenes service going on. Thanks for your ministry to your church family and others who worship elsewhere around the world. As one of the latter, I'm interested in which model DPA headset mic's you went with and what made you select them? We're shopping for a headset microphone for myself as I lead worship and could use any of your expertise.